GEI Works' erosion control blankets offer a range of natural fiber products to help control erosion stabilization on slopes, channels, banks, roads, and hillsides. Working to meet both short-term and long-term requirements for erosion control construction, available products include coir, straw, wood fiber, and strawcoco blends. Browse through our variety below to find the best option for your location. If you have questions about erosion stabilization, give us a call at 1-772-646-0597 or request a price quote. This variety helps to address erosion stabilization requirements in almost any location. 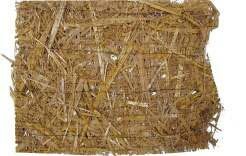 Coconut/straw blankets are typically recommended for areas that require higher flow rates, steeper slopes, or longer-term use. 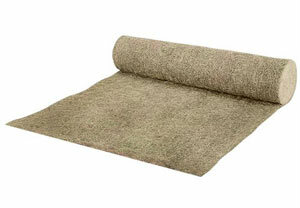 Since coir is typically longer lasting and stronger than straw, these blankets are able to accommodate areas with significantly higher flows or steeper slopes. Blended mats will usually feature a double netting design. Regardless of which blanket you choose, pegs, staples, and stakes are required to secure the matting to the slope or hill. 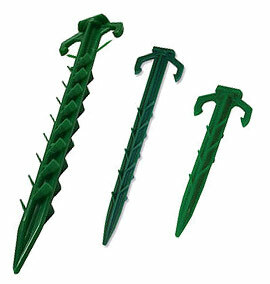 Available models include accessories made from wood or metal, as well as Biodegradable Models made from environmentally safe particles. Either can help keep your blankets securely in place for the duration of their use. 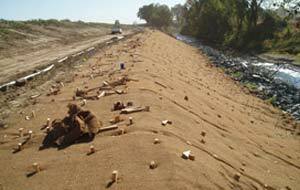 Questions about erosion control construction? We can help! Call our team at 1-772-646-0597 or fill out our quote request form to discuss your requirements.